After our night out we thought what better way to spend the next morning than at the Bernard Callebaut choclotate factory (well I did anyway). As we decended the stairway into the viewing corridor the smell of cocoa and chocolate hit you and moments later there it was, flowing, dripping, melting … oops I m drooling. 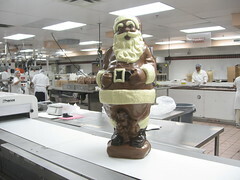 The highlight was the giant chocolate Santa and a few samples in the chocolate shop at the end of our self guided tour. A bit of background on Beranrd Callebaut – his family home was next door to his grandfathers chocolate factory in Belgium and after what can only be described as a sweet upbringing he set up an arm of the family business here in Calgary. He now has 36 stores, including one in Tokyo and four in the United States. Needless to say we bought a bar of the dark chocolate with almonds, which I intend to enjoy with a good cup of coffee and a glass of port! p.s. Check out some of our other photo’s, one for the Comrade’s back home, the Hose and Hound, an old fire station converted into a pub. More on chocolate – a Calgarian buddy gave me a Hershey’s chocolate today, fairly common brand here, along the lines of Nestle or Cadbury nothing fancy. It was awful, Really powdery and sweet, that’s one thing we have got is good cheap chocolate. Although I have to admit I really like all the chocolate bars with Peanut Butter – my favourite is Max5 – it’s a biscuity type bar covered in peanut butter and I think it has caramel (it has been a while since I had one).